Inspiring Ideas with artist Jeanne Winters: Woo Hoo - a Giveaway!! Woo Hoo - a Giveaway!! How to win, you ask? Visit my Etsy store. Please pick your favorite art print. Come back here and tell me which one in a comment. That's it. I don't ask much. :-) Be sure and leave your email address so I can contact you when you win. Prize will ship free to a U.S. address only. I'll draw one winner from all qualified comments on Saturday, November 1st. I absolutely LOVED the "I am the vine, you are the branches" piece. I think I like it so much because I love the beauty and simplicity of the illustration, I'm wild about green, and I love that verse. My favorite is definately the I am the vine! It is one of my favorite verses! Thanks! Hey, Jeanne! I'll be the third to say the John 15:5 verse as well!! It is the key scripture to our new women's ministry at our church--which kicks off on Dec. 7. If I win, I'll let those cards be "prizes" for one of the ladies who attends the "gala!" 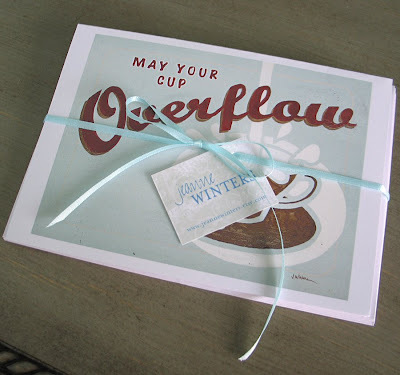 I LOVE the "may your cup overflow" notecard. Maybe it's my obsession with coffee coming out. :) Thanks for the contest! I love the "Bless our Nest" print, all of your work is beautiful! I like "Bless this Nest". Makes a beautiful wedding gift or a housewarming gift. Beautiful artwork. love the crown of beauty but then again i like anything pink ;) great work! Tough choice since I love them all, but I'll say "Everything Beautiful" The colors fit in our nursery, as do the words! The Bless our Nest is my favorite, and I'd probably end up framing these rather than sending them. They're too nice for our abusive post office (which mangles all of our mail). My favorite print is, "JOY To the World!" Heart the colors on that print, too! Thanks for the lovely giveaway-I am having one, too, please stop by and enter it! I'm hthaden at gmail dot com. Thank you! Those cards are beautiful! I love the I Am The Vine cards. I like the I Am the Vine cards! I love the Everything Beautiful. So true. My fave: I am the Vine. So beautiful! Nice cards! My favorite design is the Fruit of the Spirit one with cherries. It was hard to decide, but I loved Joy to the World. They are all cute but my fave is the Everything Is Beautiful one. I really like "bless our nest". Cup o' Joy id my fav - LOVE IT! I love your peace on earth print. With Christmas coming up I love Joy to The World! I have two favorites. The Crown of Beauty and the Peace on Earth prints. I like the Fruit of the Spirit - Pears. Thanks! I love vine and branches one!! Great giveaway!! i love the bless our nest. They are all beautiful! My favorite is Everything Is Beautiful. I like the cup overflow and the Peace on Earth prints. Your Bless our Nest and Peace on Earth are my favorite prints. They seriously have such a nice feel to them-thanks for sharing. Your cards are beautiful! I love Joy to the World over in your store, and May your cup overflow. Thanks so much for the giveaway! I like the May your cup overflow. Very pretty. I like the fruit of the spirit cherries print. Very creative stuff you have there! I'm having a giveaway on my blog for my new etsy shop..check it out! I love the Joy to the World print! love the cards! my favorite print would have to be Peace on Earth. So cute for the holidays! i hope i win! I really like the may your cup overflow! I like the May Your Cup Overflow design! 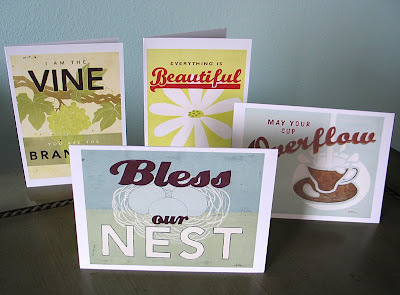 I love these cards -- they're lovely! I also really love the Joy to the World art piece from your shop. I love retro Christmas items like nothing else! I love the Joy to the World print. I love Bless our Nest....such a cute shop! Thanks for the chance to win! I like the Cup O' Joy print. I love all of them! I think I liked the May your cup overflow one the best! Thanks so much for doing this for us! I like the Joy to the World. It's getting me in the holiday mood. I love the I am the Vine, You are the Branches piece. I like Everything Is Beautiful. in my mind, the sentence is finished ... "with coffee AND with God's blessings!" I really like Cup o' joy.. I'm a coffee lover! I love the Joy to the World! I like the Peace on Earth one, because that is something I wish for all the time! I like cup o joy the best! I love the Christmas card set - how pretty! I love May Your Cup Overflow and Bless Our Nest. Well, really, I love all of them! I love the Bless Our Nest! I like bless our nest. so sweet! i love Crown of Beauty! My favorite print is Crown of Beauty. My favorite one is the Peace on Earth print! Really nice! The retro feel is just perfect for it. I love the vintage look! My two favorites are Joy to the World and May Your Cup Overflow. I love "everything is beautiful"! It's so touching. The Joy to the World is gorgeous! I like the Crown of Beauty print. It is so cute. Fruit of the spirit is my favorite! Thanks for the giveaway! I like the Peace and Joy prints....if I have to choose, I'd go with Joy. Very Jetsons looking, and lovely! I'd do my Christmas cards out of these. I like the I Am the Vine. They are so cute. Thanks for the chance to win. I actually like the one you have posted here because I am a coffee fanatic. But I went to your etsy site and I also like the Peace on Earth one as a second choice. Thanks for the contest and Happy Halloween. I like the crown of beauty print... great work! My favorite is the Christmas Note Cards - Set of Four. I am going to need some of those soon! Your signs are lovely! I really like "May your cup overflow," but I like all of the others as well! Thanks for a great giveaway! I love the "Peace on Earth" print. They're all great, so it was hard to decide! I'm a "vine/branches" fan too! Peace on earth is pretty. The Fruit of the Spirit is my favorite. But they all are very beautiful. Your art prints are all so wonderful, but I love the Cup O' Joy - because the joy of the Lord is my strength daily - far better than a cup o' joe in any contest! Thanks for your generous giveaway! I really like the "FRuit of the Spirit" card! I love the Everything is Beautiful. Thanks for the giveaway! I LOVE the May Your Cup Overflow. These are all so cute! I love the bless our nest one AND joy to the world AND peace on earth..I really like your prints! !